5 Steps to Going Paperless! 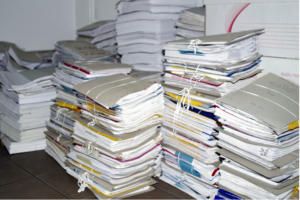 What is the paperless office all about and what do you need? Going paperless has a lot of benefits to a firm. It reduces the cost of off site storage, makes documents searchable electronically, allows lawyers to take work with them without back breaking briefs and allows documents to be shared easily with clients and others internally. But paperless does not mean without paper. Instead it means less paper. How do you do on the journey to paperless? Here are 5 steps that you should take. There should be a way to convert documents from physical format to electronic format. Typically that is done with a scanner. Most firms use the scanner located on the copier for this purpose. Care should be taken to ensure that the copier can produce scans that use storage efficiently and that are able to convert the scanned page to readable text using a process called Optical Character Recognition (OCR). A better solution however is a personal scanner that connects to the computer of the user. Whenever they receive paper they can place it on the scanner and have the pages scanned and OCRed automatically. This saves a trip to the copier each time a document needs to be scanned. Additionally, a personal scanner will straighten pages, detect single and double sided pages and automatically scan them and place the document directly into your document management system. A document management system (DMS) is a key part of going paperless. A DMS provides a consistent way to store documents that everyone can use. Because the input is consistent, users can search for and successfully find documents quickly and easily. Scanned documents can be stored with client documents by matter. Further, the full text search engine of the document management system means that you will be able to find anything whenever you need it. The DMS essentially provides a codification system for all scanned and workday documents from programs like Outlook, Word, Excel and PowerPoint to name but a few. A document binding tool will take a given set of documents and create a binder of those documents. This is useful if you visually want to look at the documents in a chronology or in the same manner that you might look at a printed and tabbed document. Locating documents on the road requires a portable device for accessing those documents. It could be a traditional laptop, a hybrid laptop like the Surface Pro or a tablet. In any event, the portable device will need to be able to access the document repository in order to view the documents. In addition to portability, remote access to the documents is also required. VPN’s often do not work in hotel rooms so a more sophisticated method of remote access is recommended. 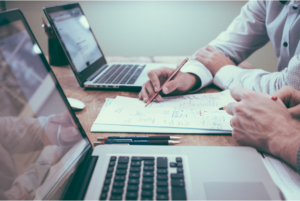 Armed with these 5 technologies, your firm is well on the way to reducing the use of paper within the office. If you would like to begin the journey to paperless, call us at 647.426.1004! For more information on how to go paperless, click here. Charles Bennett is the Principal Consultant at Triella, a technology consulting company specializing in providing technology audits, planning advice, project management and other CIO-related services to small and medium sized firms. Charles can be reached at 647.426.1004. For additional articles, go to www.triella.com. Triella is a VMware Professional Partner, Microsoft Certified Partner, Citrix Solution Advisor – Silver, Dell Preferred Partner, Authorized Worldox Reseller and a Webroot Reseller. PreviousPrevious post:Legal Change is ComingNextNext post:How to Manage Windows 10 Updates in a Corporate Environment?